The tax strategies of American (and other) multinationals increasingly drive all aspects of the data on America’s foreign direct investment. As the IMF has reported—and a quick glance at the U.S. data confirms (see table 1)—the bulk of foreign direct investment these days touches a tax haven. The correct mental image of U.S. FDI abroad these days is less a GM factory in China and more Apple’s ownership stake in its Irish subsidiary (whose main asset is intellectual property that Apple has shifted to Ireland, not any tangible asset). And the bulk of the profits that U.S. firms report earning abroad these days are technically earned in low tax jurisdiction (check out the data from the IRS for 2016). But tax doesn’t just impact the data on foreign direct investment. It has an increasing impact on the trade data too. And it also has a clear impact on the goods trade data. I often hear that pharmaceuticals are one of America’s biggest exports. But that isn’t what is in the actual trade data (see exhibits 7 & 8). American firms (or formerly American firms, if there has been an inversion) may own the intellectual property behind many successful drugs, but the active ingredients themselves are often manufactured abroad. 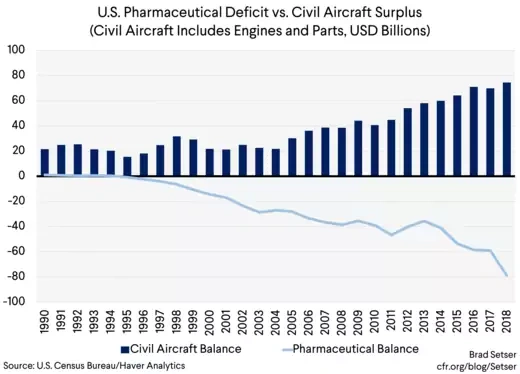 In fact, the (goods) trade deficit in pharmaceuticals now exceeds the surplus in civil aircraft. This trade isn’t obviously driven by differences in labor costs. The biggest sources of pharmaceutical imports, Ireland and Switzerland, aren’t exactly low wage countries. Trade here seems motivated in large part by the ability to use transfer pricing to shift profits to low tax jurisdictions. And the new Tax Cuts and Jobs Act if anything looks to have made those games more not less attractive. The incentive to offshore intellectual property generally remains—the “GILTI” rate on profits shifted to no tax jurisdictions is the lowest rate in the tax code. And the lower tax on intangibles than on tangibles has created an incentive to offshore actual production and jobs as well—the more tangible assets abroad, the higher your deemed tangible income and the lower your tax on your intangible income (the same is true for firms that retain their intellectual property in the United States, as there is a lower tax rate on the export of intangibles than the export of tangibles). To be concrete, a firm with its intellectual property in the Caribbean believes it can reduce its effective tax rate to under 10 percent (a rate somewhat below the global "minimum"). It is too early to say definitively that these incentives drove the increase in the pharmaceutical deficit in 2018. But it doesn’t seem too early to say that there is no evidence that these kind of tax games have gone away after the tax reform. I equally doubt that there are massive gains from trade when the United States is exporting under-priced services (R&D services, business services, or the rights for “industrial processes” e.g. chemical manufacturing) to low tax jurisdictions, and then re-importing those services in the form of high priced goods. Services exports to Ireland are around $50 billion, and less than $2 billion of that is tourism. And imports of manufactured pharmaceuticals from Ireland are now over $35 billion (the end-use data for Ireland will be public here soon for 2018, I used a specialized data set). Yes, this results in a services surplus—but the services exports are directly tied to higher imports of goods and lower exports of goods (as U.S. firms export their IP to low tax jurisdictions instead of producing the active ingredient in the United States). The numbers involved here aren’t small. 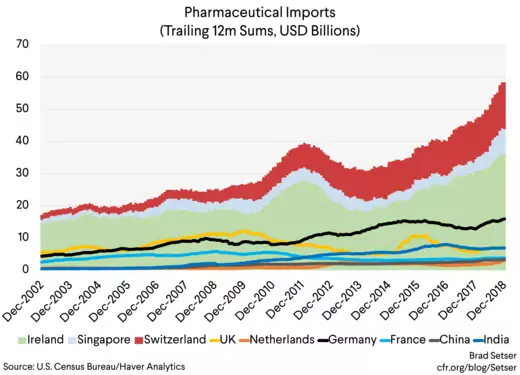 Imports of pharmaceutical products are getting close to 1/15th of total U.S. non-petrol goods imports. These kind of tax games aren’t the most attractive feature of globalization. But what sure looks like trade in tax has an increasing impact on all parts of the balance of payments data. I consequently am glad that the IMF is now taking this topic much more seriously. * Data on the geographic distribution of U.S. services exports can be found here, in the interactive tables (tables 2.2 and 2.3). I haven’t done a formal statistical analysis but my eyeball regression suggests a correlation between large U.S. service exports to a certain jurisdiction and large offshore profits from U.S. firms in those jurisdictions. Ireland, for example, is the largest single U.S. export market for both R&D and professional and management services. It single handedly accounts for about 20 percent of U.S. exports in both categories. Ireland is also the largest single market for U.S. exports of software related intellectual property, and now narrowly loses out to Switzerland as a market for U.S. exports of intellectual property related to industrial processes (think manufacturing of active ingredients for pharmaceutical products). ** The U.S. for example exports $50 billion in services to Ireland (for comparison, Ireland’s GDP was about $250 billion before Apple put on a green jersey and emerged as a tax resident of Ireland in 2015). 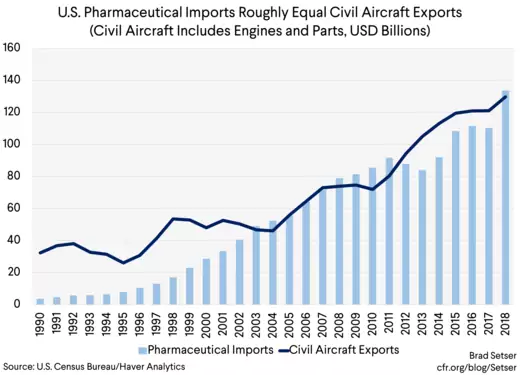 *** That would rise to close to 1/12th of total non-petrol imports if the $35-40 billion in pharmaceutical imports from Puerto Rico were counted in the U.S. external trade data. Puerto Rico is part of the United States for customs purposes, so it isn’t counted (fairly). But Puerto Rico is not part of the United States for tax purposes, so the pattern of trade is still distorted by firms’ tax strategies. Puerto Rico has been losing out relative to other low-tax jurisdictions over time, but pharmaceuticals still generate a large share of its “exports” and a special tax on the “offshore” pharma industry (Act 154) accounts for a surprisingly large share of Puerto Rico’s tax revenues.